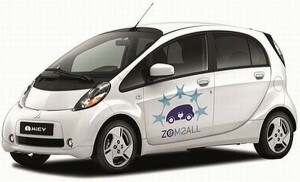 The project ‘Zem2all‘, that will shortly turn the city into a testing lab about the use of the electric car, has created a great expectation amongst many companies, institutions and private individuals. Over a hundred people are already interested in participating in this pioneer test, which means that, at a subsidised cost, a total of 200 Mitsubishi iMiev cars will be circulating the streets; together with an equivalent amount of recharging points in houses or bases and other 23 quick refuelling stations in various points of the city, like in Fuengirola and Marbella. All of this, in virtue of an agreement between the town hall and the government of Japan. Amongst the potential participants there are already from average citizens, who’ll use it to get to work and back or run some short-distance errands; to fleets of vehicles of different sectors (distribution, commercial, etc. ); Energy specialists from Malaga University; companies of this same sector and from the PTA (Andalusian Technological Park). Added to these are the twenty that the Consistory initially assigned, that will be going to the corresponding departments in virtue of the use and of the necessity to move around. Those in charge of the project emphasised that the selected will depend on up to 16 different parameters, that respond to the need of counting for the “experiment” with different types of users, with trips and frequencies of different use. There will be a selection made amongst all those interested, and the final purchasers will have to pay a monthly instalment of about 200 euros, to which another 50 euros is added (on average) every month for the installation of the recharging points in the garage of each house or in the base of the participating entity. This figure includes the complete maintenance. The “fuel” consumption (electricity) is estimated at around 26 euros a month. These requirements respond to the fact that ‘Zem2all’ is a unique research in Europe in which its plan -through the drivers’ experiences and the localisation systems of the cars- is to discover all the possible problems; specially the ones referring to the electric vehicle’s main battle horse, which is its limited battery life in the case of the model that’ll be used, about 150 kms after a complete recharge (which makes it necessary to plug it in almost every night). The first vehicles will begin to circulate as from next autumn.